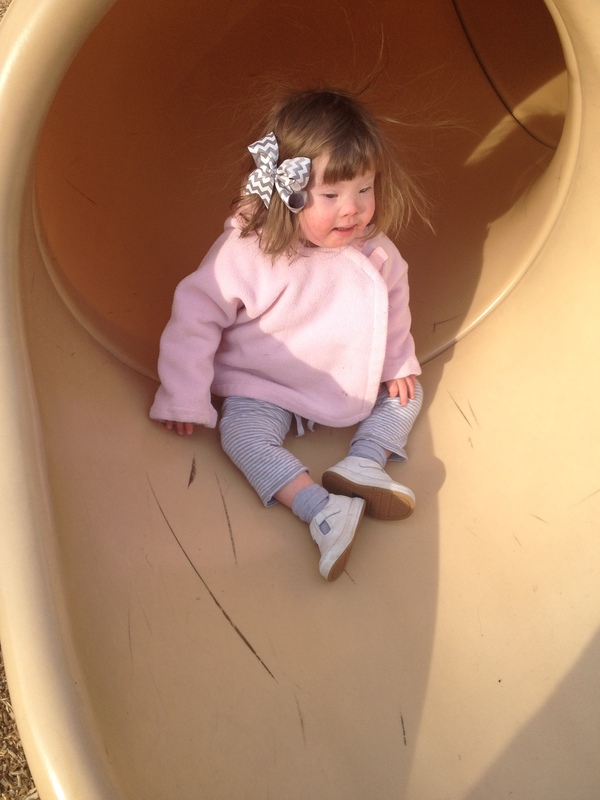 Today is World Down Syndrome Day and I’m participating in a blogging project Meriah Nichols at A Little Moxie and the lovely ladies at the Down Syndrome Diagnosis Network have created called A Day in the Life of Down Syndrome. Blogging, as you may have noticed, hasn’t exactly fit in with my lifestyle both because of business and because of lack of inspiration. I created this blog to be my space to write about Down syndrome but most days there’s not too much to say. I started a post detailing a typical day over a week ago but never published it because it was ridiculously boring. I suspect that is the point of this project. 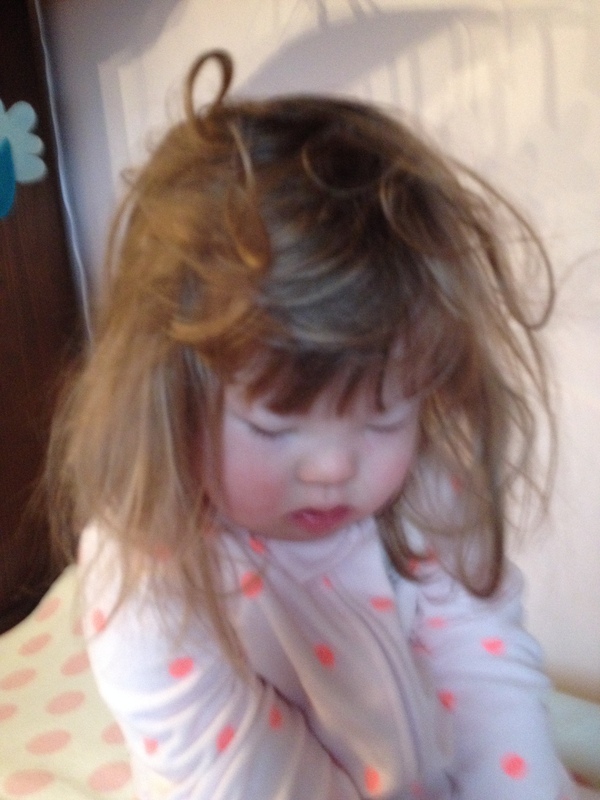 Most of Natalie’s days start by being woken up either intentionally (by me) or incidentally (by her brother). She’s not a fan, regardless of how it happens. So not in the mood for pictures. Once she’s up she immediately starts asking for her “sauce”. Natalie takes levothyroxine for her underactive thyroid and since it only comes in pill form I crush it and give it to her with a little bit of applesauce. From there our lives are pretty much the same as everyone else I know who stays at home with young children. Lots of feeding and cleaning up, preschool for Logan, play dates, errands, park days, coloring, playing, TV, tantrums, timeouts, tickling, singing, dancing, and giggling. 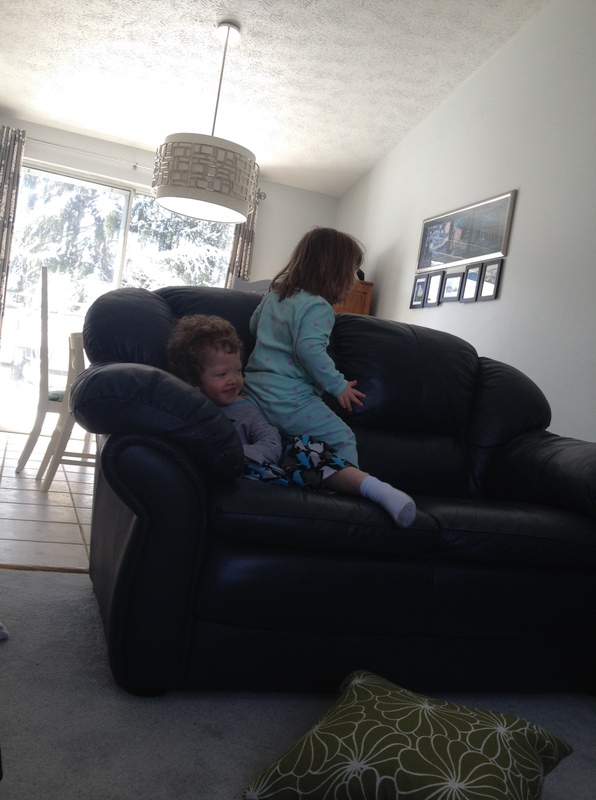 I don’t think it’s due to her extra chromosome, but Natalie does seem to enjoy sitting on her brother more than other two-year old children I know. This is why he’s here, right? Natalie also has three therapy sessions every week. The county provides occupational and physical therapists that each come every other week and we take her to private speech and another physical therapy session every week. I vacillate between, “this is a waste of time” and “we should be doing more” which I guess is a nice equilibrium. I do feel very fortunate to have other (professionally trained!) adults who care about Natalie and are invested in her progress. Natalie tolerates and even likes therapy sometimes, much more than when she was younger. 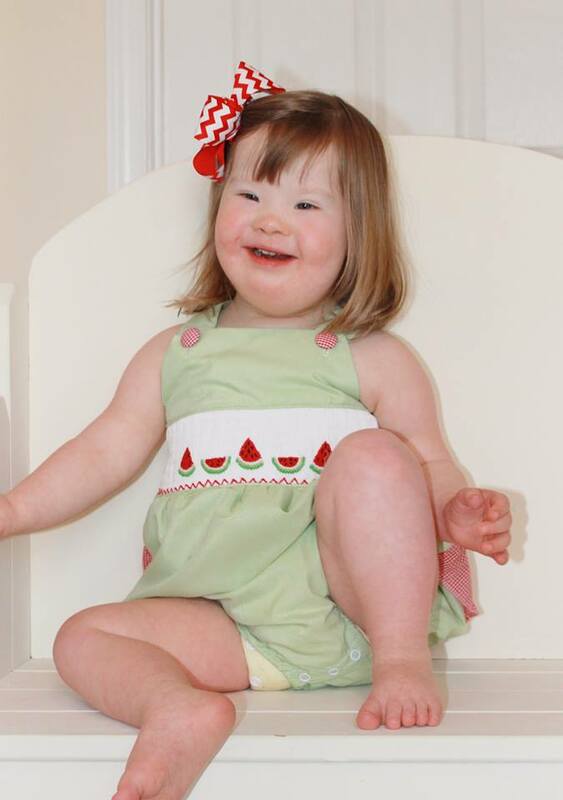 The most challenging part of daily life with Down syndrome for me is that Natalie is not walking yet. She’s so close (10 unassisted steps so far) and can go anywhere she wants in our house (including on top of the bathroom counter, yikes!) but keeping her happy outside or in places it’s not safe for her to be on the floor can be hard. She’s also really heavy! We get a lot of use out of our $20 umbrella stroller. Despite not walking she will climb playground ladders and hurl herself down tunnel slides. Most days I can say with certainty that I wouldn’t change Natalie’s Down syndrome. I don’t know exactly where I fall on the “does her extra chromosome shape her personality” question though I lean toward thinking yes. I do know that who she is and who she is becoming is partly due to her experiences and having to work extra hard to achieve some milestones. She’s fiercely independent, bossy, opinionated, suspicious, sensitive, and cuddly. She has high self-esteem (“I did it! Yay!”) which I credit to having early intervention specialists come to the house to applaud everything she did from the time she was one month old. She announces “all done” whenever she decides she’s finished with something (including being quiet during church) and many of her first words have been instructions to others (“stop”, “stay right there”, “sit”). She is happy to play alone for long periods of time and I’ll often find her in her glider upstairs with a baby doll on her lap pretending to read books or sing to the baby while she rocks. She understands limits I’ve set but only abides by them if I’m watching. She loves music and dancing, The ABC Book, cheese, baths, her daddy, Vaseline on her lips, and blowing bubbles. She hates getting her hands washed in the sink, citrus fruits, loud noises, wearing shoes or hair bows, and when people put their hands on a chair she’s using. 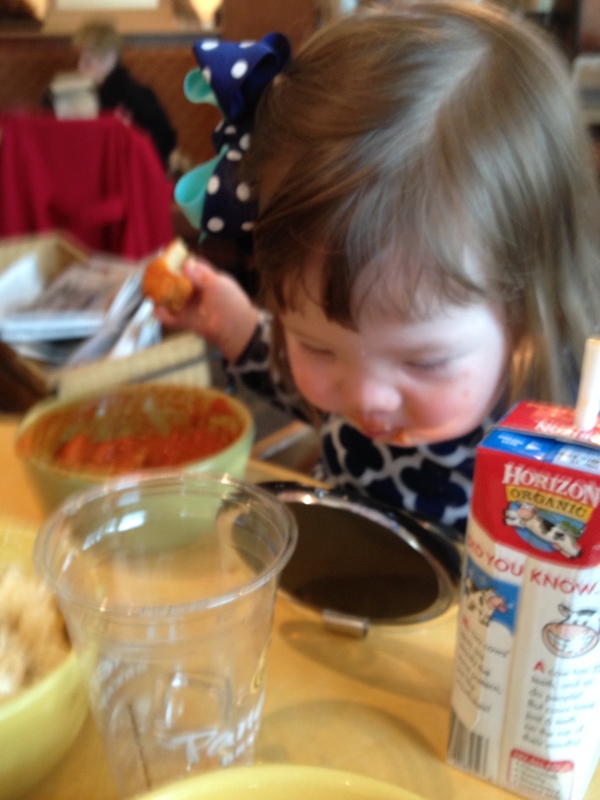 Eating soup and checking herself out in the mirror. She likes what she sees. Except maybe for that bow. Three years ago I thought my daughter’s impending arrival meant life was going to change, that our days would be different and harder because she had an extra chromosome. I was wrong. I won’t deny that Down syndrome is a constant part of our lives, and something we think and talk about often. But it’s just a part and doesn’t define us any more than any other part of our lives. March 21, 2015 at 10:24 pm. Permalink.